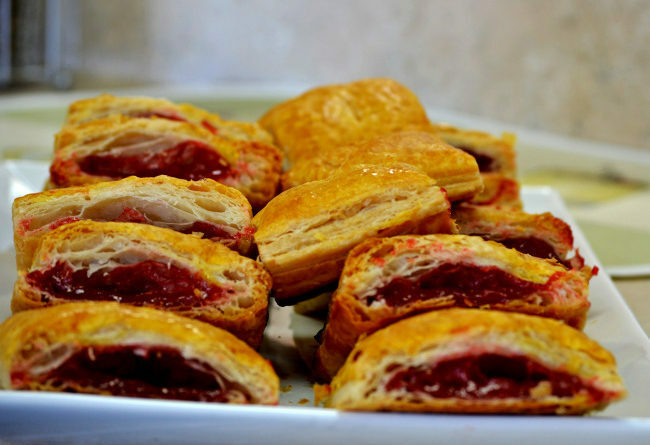 Growing up Cuban in Naples, FL meant that you made a lot of friends that had never heard of pastelitos de guayaba (guava pastries). Your heart just broke when you discovered they had never tasted the sweet deliciousness of these remarkable pastries and you made it your mission to delight their taste buds with just a bite because, well, that’s all you would give up. If you’re reading this and laughing then you’ve probably been there, but if you are still confused as to what we’re talking about then you may need to make a stop at La Sorpresa Latina Cuban Café to understand the depths of what you’ve been missing. A pastelito de guayaba is a baked puff pastry filled with guava – and sometimes even a little cream cheese if you’re feeling adventurous – and drizzled with a sweet glaze. Cuban cafes in Naples, Miami, and anywhere else that has a distinct population of Cuban folks sell them as a snack or dessert, typically with a steaming cup of Cuban coffee on the side. At La Sorpresa Latina Cuban Café, our customers stop by for this tasty snack at all hours of the day and their parties are made complete by ordering our tray of pastelitos as appetizers, along with many other traditional Cuban pastries offered through our catering services. In theory, you can make these yourself at home by using guava, cream cheese, and pastry sheets or you can just stop by La Sorpresa Latina Cuban Café where we always have those crunchy and sweet squares of deliciousness waiting for you. At our Cuban café, our pastries are baked fresh daily so you know they’re good – especially with some Cuban coffee or a café con leche (we’ll talk more about this yummy drink later). Okay, enough pastry talk, I’m going to go grab one for the road. Contact us or take a look at our menu to see what other traditional Cuban food we offer at La Sorpresa Latina Cuban Café.